This basic pinpointer will help you better recover buried metal objects -- jewelry, gold, silver, coins, etc. -- quickly and easily. This is a budget-friendly accessory that can save you time when treasure hunting (or if you lose your ring or keys while gardening or working in a confined space). 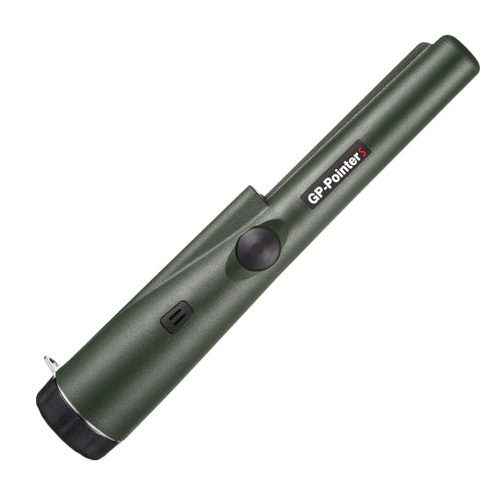 Ultra portable and light-weight so you can locate metal objects in soil or sand with speed and accuracy. Once you’ve detected something metal with your full size metal detector and dig your plug, use this pinpointer to get an exact location of the target in the hole. This handheld wand enables you to determine exactly where the treasure is buried, keeping you from having to dig and sift through buckets and buckets of dirt. Requires 9V battery (not included). Made in China. Includes written owner's manual in box. Do not submerge pin pointer in water. Audio and Vibration Alerts -- as pinpointer gets closer to metal object, the buzzer sound and vibration increases.